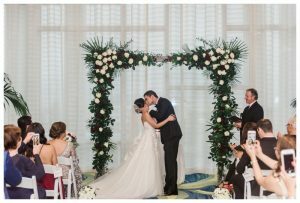 What was planned to be an outdoor wedding on the lawn, turned out to be an elegant ceremony inside the beautiful Opal Sands Resort in Clearwater Beach on January 4th with Andrea & Tarik. The rain cleared just in time for amazing photos by Renee with Elsie J Photo, capturing the magic, along with amazing videographer Chuck with Hearts Video. CJ Inzirillo with Days Remembered & Diana Cardenas with the Opal Sands did an awesome job pulling it all together as Raphael with Breezin’ Entertainment filled the air with music! Trudy Melissa Cakes provided delicious sweets, and Events in Bloom set the floral atmosphere! An amazing day with an amazing couple!